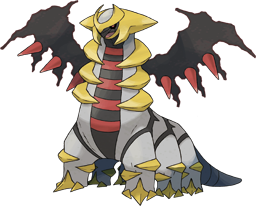 Giratina does not evolve/is not evolved into. X This Pokémon is said to live in a world on the reverse side of ours, where common knowledge is distorted and strange. X Es lebt in einer Zerrwelt, die auf der Kehrseite der unseren liegt und die sich aller Logik entzieht. X Il vit dans le Monde Distorsion, un monde à l’opposé du nôtre qui échappe au sens commun. X Vive en el Mundo Distorsión, un mundo opuesto al nuestro y cuyas leyes desafían el sentido común. X Vive nel Mondo Distorto che, sfidando l’ordine cosmico, si trova sul lato opposto al nostro. X 상식이 통하지 않는 이 세상의 이면에 있다고 불리는 깨어진 세계에 서식한다. Y It was banished for its violence. It silently gazed upon the old world from the Distortion World. Y Es wurde aufgrund seines Verhaltens verbannt. Aus der Zerrwelt schaut es auf die alte Welt. Y Sa grande violence lui a valu d’être banni. Il observe les hommes en silence depuis le Monde Distorsion. Y Fue desterrado por su violencia. Observa el mundo en silencio desde el Mundo Distorsión. Y È stato bandito per la sua violenza. Osserva il vecchio mondo in silenzio dal Mondo Distorto. Y 난폭하다는 이유로 쫓겨났지만 깨어진 세계라고 전해지는 장소에서 조용히 원래 세계를 보고 있었다. Omega Ruby It was banished for its violence. It silently gazed upon the old world from the Distortion World. Omega Ruby Es wurde aufgrund seines Verhaltens verbannt. Aus der Zerrwelt schaut es auf die alte Welt. Omega Ruby Sa grande violence lui a valu d’être banni. Il observe les hommes en silence depuis le Monde Distorsion. Omega Ruby Fue desterrado por su violencia. Observa el mundo en silencio desde el Mundo Distorsión. Omega Ruby È stato bandito per la sua violenza. Osserva il vecchio mondo in silenzio dal Mondo Distorto. Omega Ruby 난폭하다는 이유로 쫓겨났지만 깨어진 세계라고 전해지는 장소에서 조용히 원래 세계를 보고 있었다. Alpha Sapphire This Pokémon is said to live in a world on the reverse side of ours, where common knowledge is distorted and strange. Alpha Sapphire Es lebt in einer Zerrwelt, die auf der Kehrseite der unseren liegt und die sich aller Logik entzieht. Alpha Sapphire Il vit dans le Monde Distorsion, un monde à l’opposé du nôtre qui échappe au sens commun. Alpha Sapphire Vive en el Mundo Distorsión, un mundo opuesto al nuestro y cuyas leyes desafían el sentido común. Alpha Sapphire Vive nel Mondo Distorto che, sfidando l’ordine cosmico, si trova sul lato opposto al nostro. Alpha Sapphire 상식이 통하지 않는 이 세상의 이면에 있다고 전해지는 깨어진 세계에 서식한다. Diamond A Pokémon said to live in the world beyond this one. It appears at ancient graves. Pearl A Pokémon said to live in the world beyond this one. It appears at ancient graves. Platinum It was banished for its violence. It silently gazed upon the old world from the Distortion World. 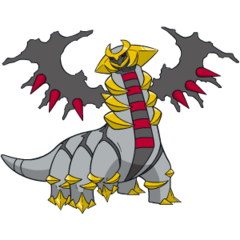 HeartGold This Pokémon is said to live in a world on the reverse side of ours, where common knowledge is distorted and strange. SoulSilver This Pokémon is said to live in a world on the reverse side of ours, where common knowledge is distorted and strange. Black It was banished for its violence. It silently gazed upon the old world from the Distortion World. White It was banished for its violence. It silently gazed upon the old world from the Distortion World. White 2 It was banished for its violence. It silently gazed upon the old world from the Distortion World.